Submitted by Alexander Briones on Apr. 4, 2018. Originally published on Mar. 29, 2017 and last updated on Apr 4, 2018 by Alexander Briones & Jason Horton. Whether you play Electric Guitar, Acoustic Guitar, Acoustic-Electric Guitar or Bass, we've got you covered with what we believe is the most comprehensive guitar tuner guide currently available, updated for 2018. For this update, we short-listed almost 60 tuners and analyzed over 32,000 sources to bring you recommendations that better represents current market sentiment. These have become the most popular form factor for guitarists as they're small and easy to carry around with you. They also tend to be quite inexpensive compared to other types which means many guitarists often buy a couple of them at a time. 94 out of 100. Incorporating 2400+ ratings and reviews. The KLIQ UberTuner continues to be the highest rated clip-on tuner for guitar available. KLIQ Music Gear is a business started by a group of working NYC musicians who wanted a better clip-on tuner than what was available at the time. The speed and accuracy of their UberTuner have impressed musicians from hobbyists to professional touring artists. The speed with which the UberTuner detects frequency continues to impress many users, to the extent that it is its most liked feature. A charter member of acoustic guitar forum said, "The UberTuner goes right to it where the Snark has a second or two hesitation." The brightness and visibility of the screen are the second most liked features. Rich Osweiler writes in Premier Guitar, "Turn it on, however, and the large, color display become (sic) as bright as your prized lava lamp. The flat/sharp and note indicators are, yes, uber-easy to read." There are a few people that said it isn't sensitive enough to detect notes accurately on their guitars - this came from some playing nylon string guitars and some with smaller parlor sized guitars. Still, the negative reviews amount to less than 6% of all reviews, many of which are from people using the UberTuner with instruments other than guitar. Overall, you can't go far wrong buying the highest rated clip-on tuner currently available. The Snark ST-2 is a clip-on chromatic tuner that's designed for acoustic instruments, primary of which is the acoustic guitar. It features a compact profile that has endeared the Snark brand to many players, while housing a faster chip that improves the speed and accuracy of its tuning. In addition to its vibration sensor, it also comes with a built-in microphone, which allows it to tune other instruments that it can't clip on to. Other features include a 360 degree swivel, power save, tap tempo silent metronome, and transpose tuning. Snark advises against using the ST-2 on instruments with sensitive finishes, like nitrocellulose lacquer, oil finish, polyurethane and French polish. Dimensions: 1.8" x 1.8" x 3.5"
Most reviewers point to the Snark ST-2's value for money and bright display as its best traits. Many are satisfied with its versatility and practicality, with its built-in mic and pivoted display. Even non-guitar players find themselves impressed with its overall accuracy and performance. There are a few users who have qualms with its accuracy, stating that while its good enough for day to day use, it does not have the accuracy of a true chromatic tuner. There are also some who caution that the clips can break if not handled or used properly. With its good overall market performance, the Snark ST-2 is a great tool for guitarists and multi-instrumentalists. The Snark SN-1X is the newer version of the old Snark SN-1. It is a stripped down version of the Snark ST-2, without the built-in mic - designed specifically for guitars. As such, it is slightly more affordable, while offering the same functionalities that you need to get your guitar in tune. 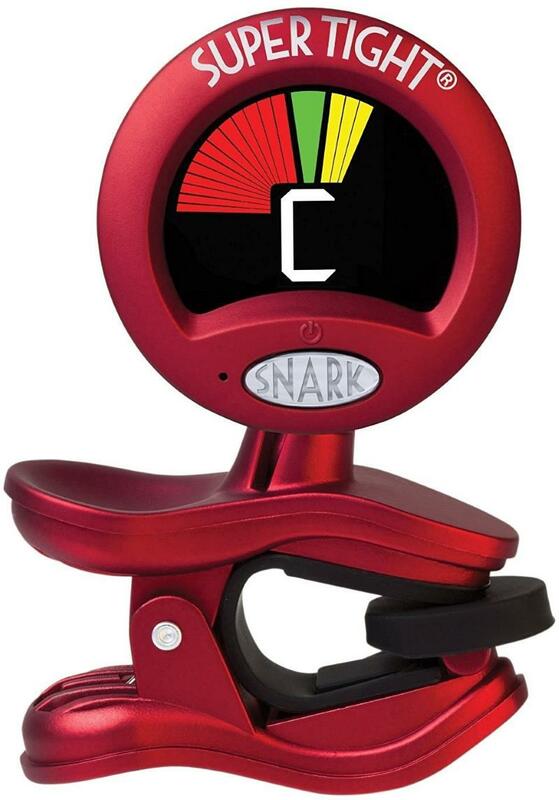 This version of the Snark also works as a chromatic tuner and allows flat tuning and works with a capo. It also includes a tap tempo metronome that gives you visual cues of the beat. It doesn't have special modes for alternate tunings such as DADGAD but you can tune to those in chromatic mode. The bright multi-color display is well received in customer reviews. Quite a few bass players give it the thumbs up. Many beginning guitarists say that it is very easy to use. Good value for money or words to that effect come up frequently in customer reviews. Some people report noticing faster reaction time than earlier Snark tuners. There were no consistently reported negatives in customer reviews. One person claimed it used up the battery too quickly and another complained that the instructions they received weren't specific to this model. One person complained that it wasn't as accurate as a pedal tuner, but generally speaking, that is to be expected of clip-on tuners. Snark did not respond to our email request for information - something to consider if customer support is important to you. If value for money is your primary concern then it's hard to find anything that beats the Snark in this regard. This is where we sometimes present additional options which you may also find interesting and useful. In this case, it's a clip-on tuner which you can use to tune all strings simultaneously. 91 out of 100. Incorporating 1600+ ratings and reviews. The major point of difference with this tuner is that it allows you to strum your guitar and see the tunings for all the strings simultaneously - this makes it easy to see which string is out of tune. Note that this feature only works for standard tuning on the clip-on version. It also works as a regular chromatic tuner showing one note at a time, and when used in strobe mode it has an exceptionally high accuracy of ±0.02 cents. Based on our own data collected through other websites, this is one of the top selling clip-on tuners for guitarists. As you'll see if you read the report on the TC Electronic Polytune 2 pedal tuner, their customer support is responsive and quite helpful - that's often a big plus for many. Guitarists who speak positively about this tuner don't just like it - many of them claim it's the best tuner hands down or words to that effect. Both electric and acoustic guitarists liked it. Its level of accuracy came in for praise in many customer reviews. There were even a number of bass players who said it worked very well for them. The most common negative was that some guitarists said that it was over-priced or that the relatively high cost wasn't justified by the polytune feature - some regarded it as a bit of a gimmick. A small number of people complained that it wasn't as accurate as they would have liked when used in polytune mode. Although there is some contention over the polytune concept, we know that it is a top seller on some websites, and that those who do like it tend to have stronger positive things to say about it than for most other clip-on tuners available. Although clip-on tuners are all the rage these days, there are still many guitarists who prefer to have their tuner on their pedalboard. The advantages are that they mute the signal when tuning, are less susceptible to interference from any noise on stage than clip-ons, and some guitarists don't like the look of having something on their headstock while playing in front of an audience. 94 out of 100. Incorporating 2050+ ratings and reviews. Boss are well known for building robust effects pedals, and that applies to the Boss TU-3, which continues the be the favorite tuner of many guitarists and bassists. Not only does the TU-3 have guitar, bass and chromatic tuning modes, it can also display notes for 7 string guitars and 6 string basses. Guitar mode also supports alternative drop tunings. The optional PCS-20A Parallel Daisy Chain DC Cord allows you to power up to 7 other pedals when using the tuner with the PSA-120S power adapter. Although I didn't do a comprehensive count, I did notice the word "love" in more than a dozen positive customer reviews. Those who had upgraded from the earlier TU-2 were impressed by the increased level of accuracy of the TU-3. Many guitarists who had used it at outdoor venues praised the brightness of the display. Positive sentiment was evident from both electric and acoustic-electric players. The quality of the build also came in for much praise from those who had been using it for a long time. There were few consistently reported negatives. A couple of people complained about the price and one person even suggested the power adapter should be included in the price - but this is rarely the case with guitar pedals in general. Boss says the TU-2 was the highest selling pedal tuner in its day and the upgraded TU-3 appears to be the top selling one now. Many handheld tuners have built-in stands and can also be referred to as Desktop Tuners. These types of tuners can be used with just about any type of instrument by using their built-in microphone or by plugging in directly. These are also the preferred alternative to clip-on tuners for acoustic guitars without pickups. 92 out of 100. Incorporating 1650+ ratings and reviews. 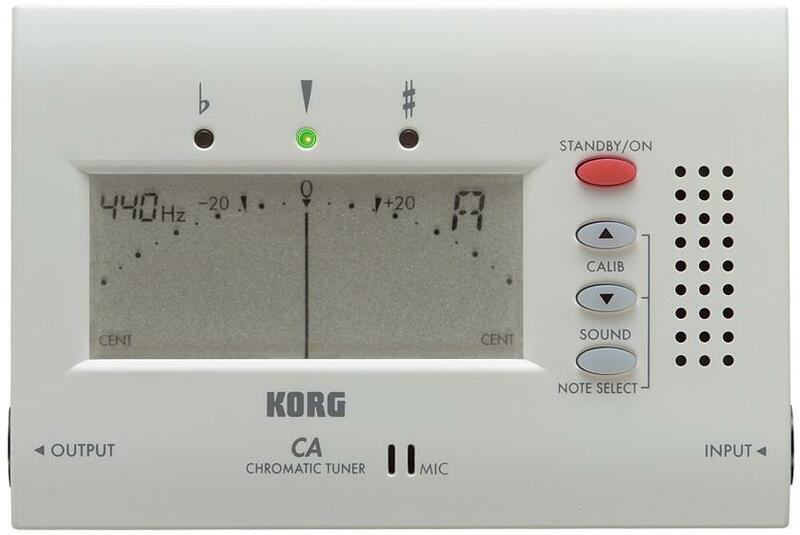 The Korg CA-40 has a handy battery saving feature where it turns itself off when left on unused for 20 minutes. It's not specifically designed for guitar but has found a place with guitarists who also play other instruments from ukulele to brass and woodwind, or who share it with others at home who play those instruments. Although it does have a bypass output jack which Korg say is good for live use, like all handheld tuners it's not particularly practical for guitarists to use during a live performance setting but is fine for tuning in between sets, home use and practice sessions. Value for money is one of the main features that make this tuner appealing. It is reported to work well on all kinds of fretted instruments including bass guitar. Some people have reported issues with the needle not stabilizing but others have suggested this may indicate a need to change the batteries. If you don't need a tuner for live use and just want something that does the job and works with all kinds of instruments, then this is a good choice for you. Some guitarists and bass players prefer to use rackmount effects instead of pedalboards and it's mainly these people who prefer rackmount tuners for live use. Some people also have them in their studios. Peterson are well known for making high-end tuners of all types. 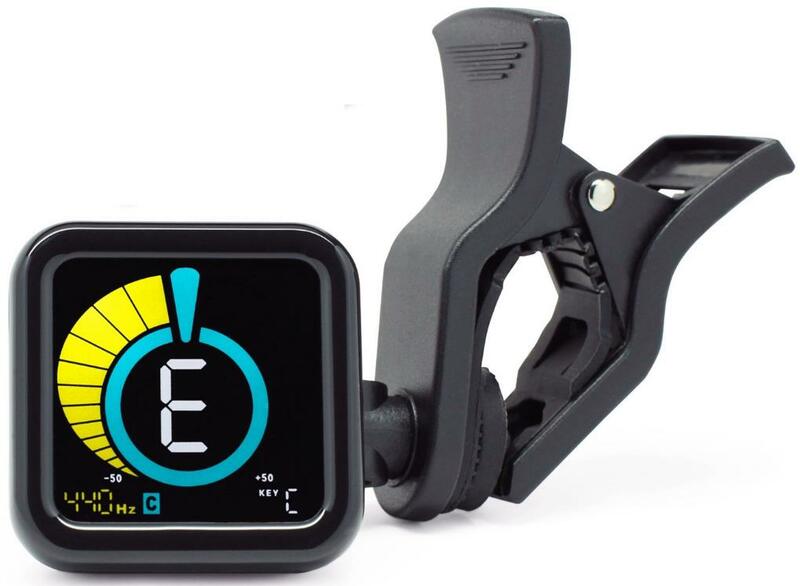 This tuner is used not only by guitarists but has also found a home with guitar technicians who use it for performing set ups and adjusting intonation. It's also used on stage by guitarists who appreciate the wide range of guitar-specific tuning modes it offers. One of its many stand-out features is that it also has a specific mode for tuning 12 string guitars. Another is the ability to set up to 8 user presets which Peterson calls 'Sweetened' tunings. In short - this is almost certainly the most feature packed guitar tuner of any kind available today. Many guitarists say this is the best tuner they've every used. Fast response and very accurate are phrases that come up frequently in user and customer reviews and forum posts. It is also cited as being very durable by guitarists who take it on the road. The display has received a lot of praise for being bright, clear and easy to see from across the stage. Basically, just about every feature of the Peterson VS-R is praised by owners. There are no consistently reported negatives about this tuner. If you can afford the investment, then this is absolutely the best rackmount tuner to get. If you're looking for a rackmount option that sells for under $100 then you might like to check out the Korg PB05 Pitchblack Pro's Gearank score or see it on Amazon - it doesn't have as many tuning modes but it has a very large and easy to read display - handy when you're on large stages or if your eyesight has seen better days. A semitone is divided up into 100 cents on a logarithmic scale. A semitone is the difference in pitch between adjacent frets on a guitar. The accuracy of tuners are measured in cents. When performing live, you want a tuner that is fast - your audience didn't pay to watch or listen to you play the 'tuning song'. Most tuners are accurate enough for tuning in a live context, however when it comes to recording or working on your guitar's setup then you'll need to get a tuner that's as accurate as possible. Because you can't plug them into a tuner you need one that picks up vibrations directly such as clip-on or soundhole tuners, or one that has a built-in mic such as a handheld tuner. You can use all types of tuners with these (other than soundhole tuners on electric guitars). Most guitarists in this situation prefer clip-on or pedal tuners. If you use non-standard tunings, such as DADGAD.for example, then you'll either need a tuner that has specific tuning modes that cater for the alternates you use or you will generally need one that supports chromatic tuning. Some more expensive tuners have many alternates pre-programmed and some will let you create user presets. With clip-on tuners, you can turn your guitar's volume down because they pick up the vibrations directly through your headstock. Pedal and Rackmount tuners have mute options. Handheld tuners typically have both built-in mics and a 1/4" input that you can plug into so they work with just about every type of musical instrument. Clip-ons are also quite versatile working with most fretted instruments and some even work non-fretted stringed instruments and some also with brass instruments. We began by looking at the top selling and top customer rated tuner lists of the major American online music gear retailers and for the 2018 update, we ended up short-listing almost 60 tuners for further analysis. This process involved collecting information from customer and expert reviews and forum discussions about those tuners. We then processed over 32,000 sources using the Gearank Algorithm to produce a Gearank score out of 100 for each tuner. Finally, I selected the highest rated tuners in each category to recommend above. Note that we dropped the sound hole tuner category since there aren't that many options available. For more information about this process please read How Gearank Works. Submitted by Dforce (not verified) on Sep. 2, 2017. 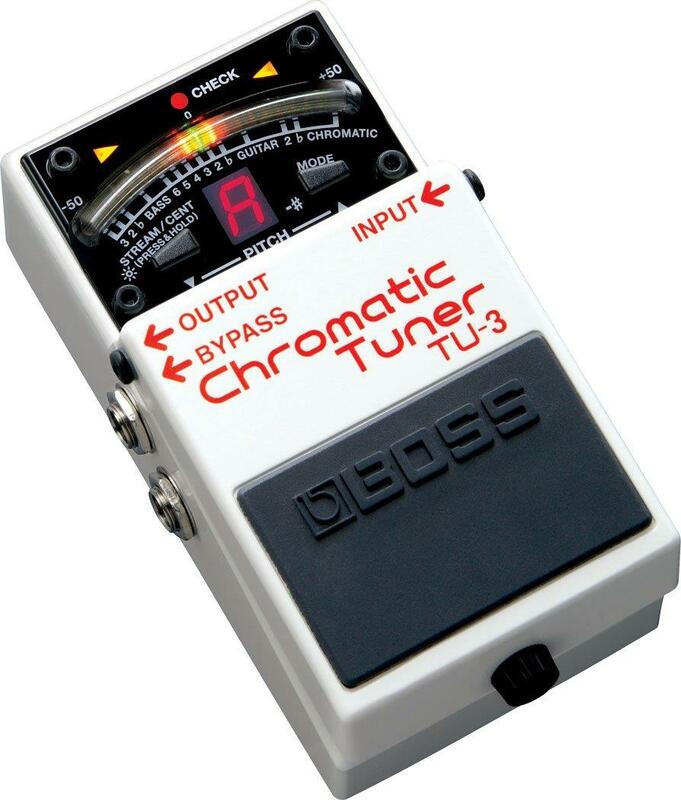 Would you rate the newer TC Electronic PolyTune 3 higher than the the Boss TU-3? Submitted by Jason Horton on Sep. 4, 2017. We haven't rated the PolyTune 3 yet so I can't say, I can say it's been getting good reviews so far. Submitted by Jason Horton on Apr. 4, 2018. We have recently rated the PolyTune 3 and you can see its ratings in the Music Gear Database. Submitted by Jason Horton on Apr. 17, 2019.